What is the quote number? We offer low cost insurance with superior coverage and support for thousands of events. 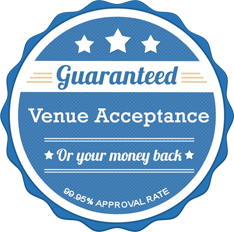 Our insurance fits 99.95% of venue's requirements. In the very rare case it does not, we will refund your entire policy. Click here to see a sample certificate of insurance. Let our innovations work for you at a fraction of the cost of our competitors. Your event is covered regardless of where it takes place within the United States. We offer additional coverage that extends to a hired or non-owned vehicle used at your event. Coverage is available if you will be selling or professionally serving alcohol. Give us a chance to meet your venue's requirements. If we can't, your policy will be cancelled for a full refund. We have the best customer service of any company in the insurance industry. We admit it. Special Event Insurance can be confusing, especially if it’s your first time purchasing. If you have any questions or issues along the way please don’t hesitate to contact our excellent support staff. How likely our customers are to recommend our special event insurance to a friend or colleague. Data Source: Our data is based on last 4,516 customer surveys collected from Jan 1, 2016 through May 30, 2018. Purchasing our insurance takes only 5 - 10 minutes. Enter your contact info, venue location & basic details about your event. You’re done! Download or email your certificates of insurance. Going paperless isn’t just good for the environment, it’s a requirement of how we run our business. Only in a paperless environment could we offer our products and service at the high level and low cost that we do today.